Some non-Stockwell news now. There is currently a by-election happening in Prince's ward (which covers Kennington and most of SE11) as one of the Labour councillors is stepping down. The election will be on Thursday 4th June. The Labour candidate is Mark Harrison, who lives on the Ethelred estate and is a community champion. Mark has lived in Prince's ward for nearly five years. He serves on the Board of the Ethelred Estate Tenant Management Organisation, the Kennington, Oval and Vauxhall Forum and the Friends of Vauxhall Spring Gardens. He is a member of the Kennington Association and attends meetings of the Safer Neighbourhoods Panel. He's also been working closely with residents of the Vauxhall Gardens and Vauxhall Five Estates to campaign for much-needed improvements for their areas. 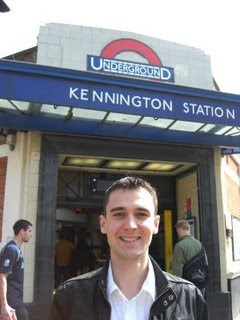 Mark wants to be a councillor who is active in the community, ready to campaign for improvements and stick up for Kennington, Vauxhall, and North Lambeth. Since the election has been called, Mark has helped secure a rent reduction for local people, launched a crime action plan, worked on saving the old Lilian Baylis school site and pushed for repairs to local roads. I'm sure Mark would make an excellent councillor.